A lanky Englishman (could he really be both the tallest and the oldest person on the ship?) in a deeply American world, with its constant exhortations to improve, to do better, Dyer brilliantly records the daily life on board the ship, revealing it to be a prism for understanding a society where discipline and conformity, dedication and optimism, become forms of self-expression. In the process it becomes clear why Geoff Dyer has been widely praised as one of the most original—and funniest—voices in literature. Geoff Dyer is the author of four novels: Paris Trance, The Search, The Colour of Memory, and, most recently, Jeff in Venice, Death in Varanasi; a critical study of John Berger, Ways of Telling; three collections of essays, Anglo-English Attitudes, Working the Room and Otherwise Known as the Human Condition (a selection from the previous two essay collections published in the US); and six genre-defying titles: But Beautiful (on jazz), The Missing of the Somme (on the First World War), Out of Sheer Rage (about D H Lawrence), Yoga For People Who Can’t Be Bothered To Do It, The Ongoing Moment (on photography), and Zona, about Andrei Tarkovsky’s 1979 film Stalker. He is the editor of John Berger: Selected Essays and co-editor, with Margaret Sartor, of What Was True: The Photographs and Notebooks of William Gedney. Can't make it to the event? You can order a signed, personalized copy of this book. We ship worldwide. Simply write "SIGNED COPY" and the name for the personalizations in the Comments field during checkout. Thank you for supporting Geoff Dyer and your local independent bookstore! The RECOMMENDED BY A STRANGER BOOK CLUB will discuss The Search by Geoff Dyer. 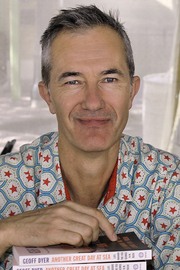 Geoff Dyer is currently considered a "single author." If one or more works are by a distinct, homonymous authors, go ahead and split the author. Geoff Dyer is composed of 3 names. You can examine and separate out names.